The City of Dallas welcomed His Excellency Joseph Boakai, Vice President of the Democratic Republic of Liberia to the Flag room of the City Hall where top city officials and corporate executives gathered to engage the Vice President in intellectual and bilateral conversations. He was accompanied by the Ambassador of Liberia to the United States; Jeremiah Sulunteh. H.E. Boakai mentioned in his remarks that the last time he visited Dallas was in 1976 and he was sure glad to be back. The Africa Liaison for the City of Dallas Regina Hill Onyeibe expressed her gratitude to the VP for his visit and expressed her optimism of the productive output. The Director, Economic Development for the City of Dallas Karl Zavitkovsky welcomed the VP on behalf of the City of Dallas just as he mentioned the dynamic diversity friendly qualities of Dallas. 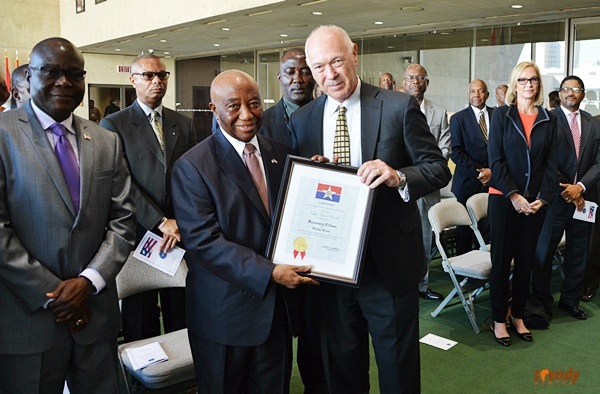 Mr. Zavitkovsky also presented the VP with a honorary citizenship of the City of Dallas. The Dallas business community represented by the Vice President, Business Banking of J.P. Morgan Chase James Tarpeh, who also is Liberian, welcomed the VP and promised him of productive cooperation from the business community.